Ever since my trip to Istanbul last year, I find myself suffering from chronic Turkish food cravings. Never have I had kebabs so mouth-wateringly tasty and juicy. And the luscious Islak ‘wet’ hamburgers… OMG. If anybody knows where I can get my hands on one of these in London, you will have my undying gratitude. In fairness though, I’ve never had to travel far from home for decent Turkish food. My local Maedah Grill continues to be ever reliable, albeit a little crowded these days (it seems the whole of Aldgate and Whitechapel have since discovered their not so secret existence now…). But if there’s one area in London I’ve yet to properly explore for Turkish cuisine, it’s the ethnic hub of Dalston and Stoke Newington to the North where Ocakbasi grills line the high street in their troves. Hence, when L from Two Hungry Girls suggested we go off the beaten track to check out her favourite Turkish joint in her old stomping ground of Stoke Newington, I was excited to see if standards were as high as word on the street. “Make sure you go to the right one guys!”, L was quick to remind us on the evening. As its slightly strange and cryptic name would suggest, there are 2 branches of the 19 Numara Bos Cirrik franchise, each located on opposite ends of Stoke Newington High Street. At the Dalston end lies the original. On the Stoke Newington end lies the sequel. It must be said though, part II definitely looked the busier of the two that evening as I passed by on the bus. To start with, we went for a couple of cold Mezzes to pick at. Both the Bakla (Fava Beans with peppers, dill, garlic and yoghurt) and Yogurtlu Patlican (Mashed Aubergine with Yoghurt) were creamy, wholesome, very moreish. What really got our salivary glands going though was their fabulous flatbread that had undoubtedly been toasted on the same Ocakbasi grill the kebabs are cooked on. Bursting full of smokiness and carnivorous flavour, the flatbread had that characteristic meaty crust you only find on a well-sealed joint of marbled meat. Deliciously addictive. Onto the mains. 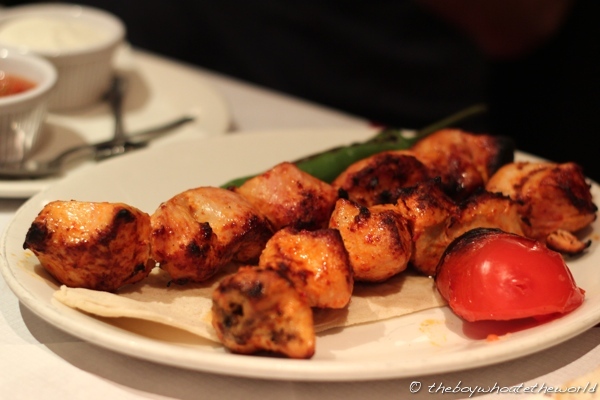 If I had one pet favourite Turkish dish, it would be Adana Kebab. 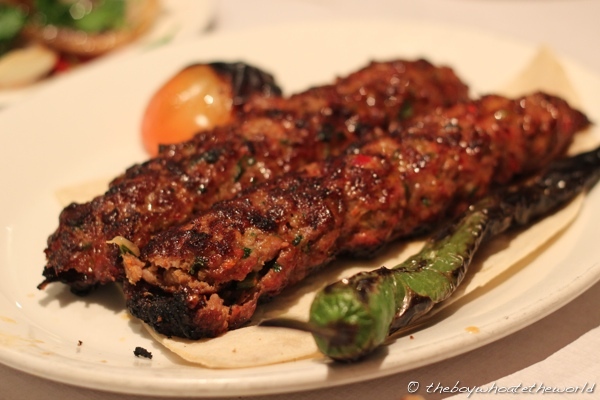 This one was packed with juicy minced lamb, spices, fresh herbs and background heat with every bite. You gotta love the whopping tree trunk portion sizes as well – excellent value for money at £11.50 for the pair. I usually avoid chicken when I’m having Turkish food as I often find it leathery and dry from over-cooking on the ocak grill. But if one dish really stole the show that night, it was their super succulent Chicken Shish which L insisted we had to order. Plump and juicy with a spicy chilli-based marinade that had penetrated to the core of each piece of meat, it’s quite easily the best Chicken Shish I have ever tasted. I’d love to find out what on earth it is they put in their marinade to get the chicken breast cubes just so incredibly tender. 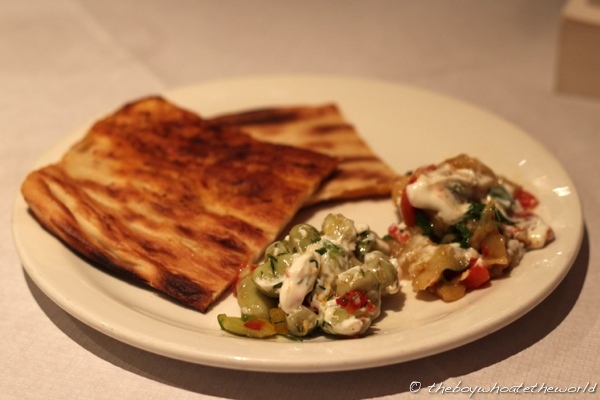 What is also worth a mention is the selection of salads that come with the kebabs on the house. 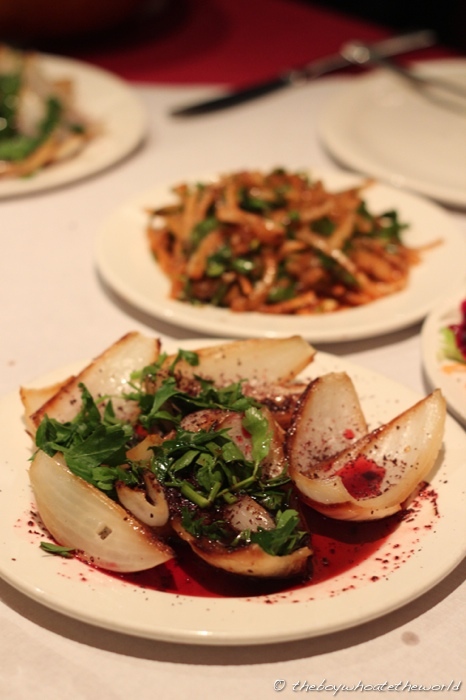 In addition to the staple fresh mixed salad of shredded lettuce, red cabbage and carrots you tend to find at any typical Turkish joint, our salad spread included a gorgeous grilled onion salad with pomegranate, sumac and parsley as well as a spicy pickled onion salad – both of which accompanied the meats beautifully. At one point, there were so many accompanying dishes around us, it almost felt like we were in a Korean restaurant. The closest thing I’ve tasted to Istanbul since Istanbul. And all this for under £15 a head including a beer. Woop. I totally agree with you. Whenever I go to that restaurant I always enjoyed tremendously the food especially kaburga and lamb shish my favourite. @Vera: Will try the kaburga next time! !